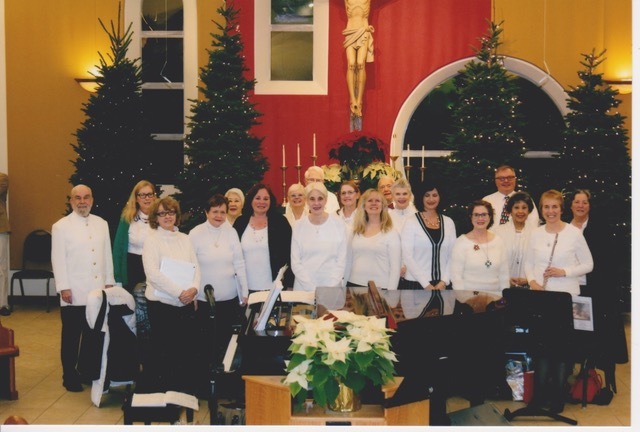 The Saturday evening musicians, Jubilate, sing a combination of traditional and contemporary hymns and often include Taize and Latin language pieces. Each member contributes their prayerful ideas as well as their voices and/or instruments. Regular rehearsals are scheduled an hour prior to the liturgy (at 4:30 PM). Rehearsals for special liturgies (Holy Week, Christmas, feast days, etc) are scheduled as needed. All are welcome to join us! If you have questions, contact Joe Shigley at jshigley@sjcissaquah.org. The Sunday morning 8:15 AM and 10:00 AM Mass choirs sing a combination of traditional and contemporary hymns. The choirs combine for special holy days and feast days such as the Easter Vigil, Easter morning, All Saints, Immaculate Conception, Christmas, Ash Wednesday, and Pentecost. Practices for both choirs are held on Thursday nights from 7:00 to 8:30 PM in the Worship Space. Members enjoy celebrating each others’ birthdays with cards and cake and are known to have really fun socials. Every hymn and song that they sing is considered a holy prayer to the Lord and this spirituality spills over into their love for each other. All are welcome! This group loves to sing and play music with the St. Joseph community, particularly contemporary Christian rock music. You’ll find them mixing it up in the Sunday night Mass, sometimes rockin’ loud, sometimes traditional, but always prayerfully making a joyful noise! Come join us and bring your enthusiasm, emotion, and rhythm to help us worship the Audience of One, the Maker of the Universe!